The red pin (below) is Rendezvous Bay. One of Anguilla's best big beaches, Rendezvous Bay is impressive. Long, expansive and with St. Martin as a backdrop, it is a favorite to many. Its perfect, powdery white sand seems to stretch forever! The Eastern end is my favorite end. Quiet and peaceful, this area is less trafficked than the Western end. Clear, still and gentle, the Eastern end soothes the south. Move further West and you will find more activity and motion, with the likes of Garvey's Sunshine Shack, Anguilla Great House, CuisinArt Golf Resort & Spa and finally, Bankie Banx's Dune Preserve on the far Western tip. Walk beyond the Dune Preserve and you will find a most special place for meditation, "Stonehenge." Rendezvous Bay is a magical beach that hasn't been too overwhelmed by development. Click for more on Rendezvous Bay. Location: Western end of the beach. 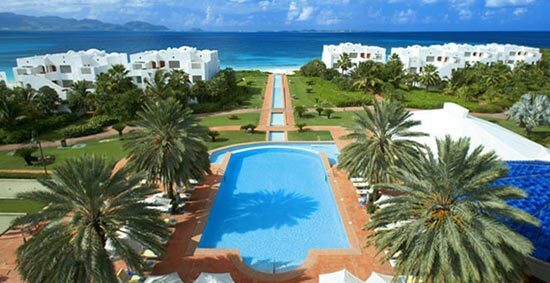 Description: CuisinArt is one of the island's top luxury hotels. Rooms vary from standard rooms to suites to large, ultra-luxurious penthouse units. All units are on the beach, except for the standard rooms. They are set further back in the main hotel lobby building. The rooms have a more contemporary American feel. CuisinArt's grounds are exquisite. Set right on Rendezvous Bay, complete with a large and inviting pool and aromatic gardens, walking through CuisinArt is always eye-pleasing. The hotel itself has a Mediterranean-type exterior. In terms of amenities, CuisinArt provides it all. The resort has its own Greg Norman, PGA-level golf course. A five-star luxury spa is on site too, providing soothing and therapeutic services. In addition to the golf course's signature Italian restaurant, CuisinArt has 3 restaurants in the resort. All vegetables are sourced at their own hydroponic gardens (tours are available). CuisinArt really does have it all. Click for more on CuisinArt Golf Resort and Spa. 2016 Update on CuisinArt Golf Resort and Spa. Location: Middle of the beach. 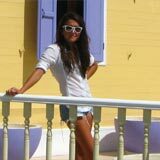 Description: Anguilla Great House Beach Resort is a good budget option. The property has a West Indian feel. 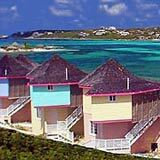 The rooms are small cottages arranged in a semi-circle, next to each other, facing Rendezvous Bay and St. Martin. Inside, the rooms are a bit stuffy and aged, but generally clean and comfortable. Outside, if you choose a unit in the "middle" of the semi-circle, you will not have immediate beach access. The beach is across a grassy yard. I suggest requesting a room on the "end" of the semi-circle. Here, the beach is at your feet. Each room has air conditioning, television, fans and small fridges. If you are traveling as a larger family, rooms can be connected. There is a good restaurant on site, The Olde Caribe that serves breakfast, lunch and dinner. Other tasty restaurants, like the Sunshine Shack, are not far down the beach. The hotel's staff is accommodating and helpful. 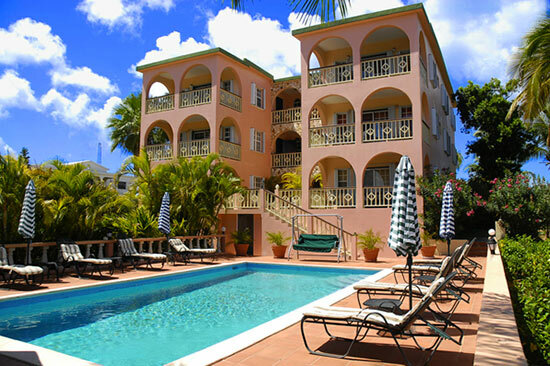 Click for more on Anguilla Great House Beach Resort. Description: Nature Garden Apartments are large and spacious, ideal for longer-term holidays (1 week+). Units are comfortable, designed for living. Nature Garden Apartments offers one bedroom and two bedroom units. Each have internet, television, air conditioning, kitchen/cooking supplies and even has a washing machine. The rooms are bright and airy, and have large patios. Rhon Connor, the property manager, lives on site and is very accommodating. These apartments are rented on either a nightly basis ($99-175 per night), or per week ($665-1050). Location: Eastern end of the beach. 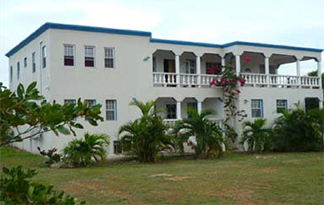 Description: Rendezvous Bay Hotel offers sweet and simple beachfront hotel units. 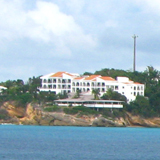 This hotel in Anguilla also has a tasty restaurant on location, The Place! Description: Royal Palms is located inland, near Rendezvous Bay. This apartment-style complex has six units. They are spacious and nicely furnished. Top units have views of the Caribbean sea and St. Martin in the distance. The apartments include two bedrooms, a bathroom, a complete kitchen, living room and of course, a balcony. Each unit also has Wi-Fi and TV. Royal Palms is dedicated to making sure you have all of the comforts of home. They are particularly family conscious, and can provide all that you may need if you're traveling with babies and toddlers. In terms of other amenities, there is a common pool area with chaises and BBQ equipment. Rates start at $225 in the off-season and go to $350 in the high season.